It is never too late to start exercising. Exercise has benefits at any age. Staying active will allow you to continue being independent and the lifestyle you enjoy. The right kind of regular exercise can also reduce your risk of heart disease, diabetes, and falls. You don't need to spend hours in the gym every day to see benefits. Moving your body just 30 minutes a day is enough to improve your health. Your exercise program may also be a way for you to socialize. Taking exercise classes or exercising with a friend are both good ways to be social. You may have a hard time starting an exercise routine. Once you do start, though, you will begin to notice the benefits, including improved sleep and self-esteem. Always talk to your health care provider before starting an exercise program. 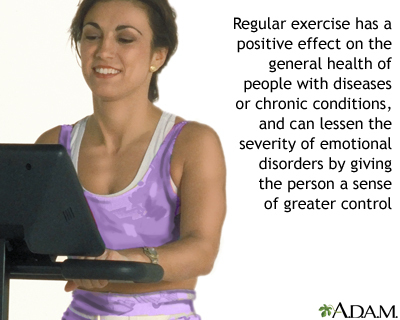 Your provider can suggest exercises and activities that are right for you. Aerobic exercise increases your breathing and heart rate. These exercises help your heart, lungs, and blood vessels. They may prevent or delay many diseases, such as diabetes, colon and breast cancers, and heart disease. Balance exercises help prevent falls, which is a concern for older adults. 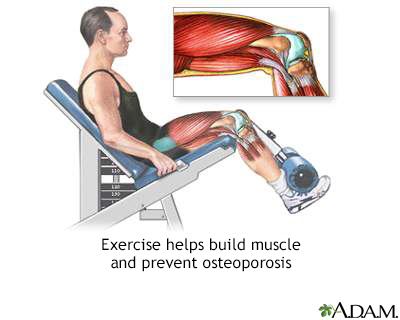 Many exercises that strengthen the muscles in the legs, hips, and lower back will improve your balance. It is often best to learn balance exercises from a physical therapist before starting on your own. Centers for Disease Control and Prevention website. 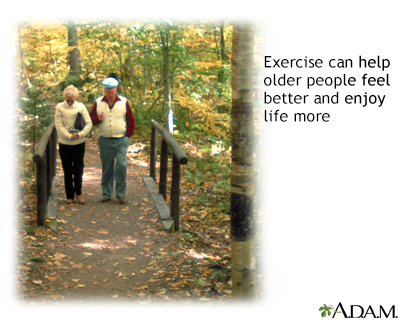 Physical activity is essential to healthy aging. www.cdc.gov/physicalactivity/basics/older_adults/index.htm. Updated June 4, 2015. Accessed June 12, 2017. National Institutes of Health, National Institute on Aging website. Exercise and physical activity: your everyday guide from the National Institute on Aging. NIA.NIH.gov website. www.nia.nih.gov/health/exercise-physical-activity. Updated December 21, 2016. Accessed June 12, 2017. Theou O, Rose DJ. Physical activity for successful aging. In: Fillit HM, Rockwood K, Young J, eds. Brocklehurst's Textbook of Geriatric Medicine and Gerontology. 8th ed. Philadelphia, PA: Elsevier; 2017:chap 99. Physical activity contributes to health by reducing the heart rate, decreasing the risk for cardiovascular disease, and reducing the amount of bone loss that is associated with age and osteoporosis. 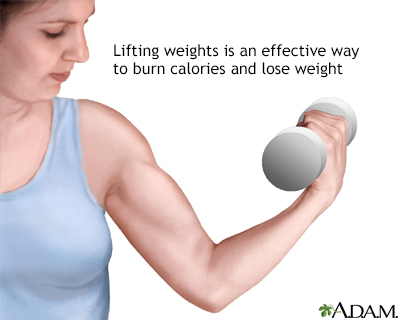 Physical activity also helps the body use calories more efficiently, thereby helping in weight loss and maintenance. It can also increase basal metabolic rate, reduces appetite, and helps in the reduction of body fat. Exercise can help older people feel better and enjoy life more, even those who think they are too old or too out of shape. Exercise, such as weightlifting, helps build muscle that is usually lost with age and puts stress on bones which helps keep them strong and healthy.